After hearing a few speakers outside MUSC, we marched around campus and convened inside the student centre, standing on the steps above Union Market and calling on those sitting below us to join for the remainder of our march. A couple hundred folks sat staring at us, some of them squirming, and none of them joining. It would be easy to call it apathy, and no doubt that is part of the problem. More productive, however, would be to think critically about some of the factors at play. As universities increasingly privilege economic efficiency above education (think growing class sizes, 4-year funding caps on PhDs, and the AUCC’s recent redefinition of academic freedom), students have also come to view university as a bit of a credential factory. Enter, pay, write some essays/exams, (hopefully) pass, collect degree, enter job market. Education as economic transaction is the name of the game, except universities are churning out graduates into a free-falling job market. Students are stuck between a rock and a hard place. If you agree that universities ought to be degree factories (I don’t, but nor do I support the elitist argument that we should ‘tighten’ up entrance standards so that fewer folks are admitted), one should at least support tuition reductions on a pragmatic level. Tuition rates are increasing beyond the rate of inflation, and the average student graduates with tens of thousands in student debt. I currently owe $27,000, and I’m on the better end of the spectrum. Add to that the fact that many students are having trouble finding work upon graduation (and I mean any work, not ‘careers’), and the fight for reduced tuition should be a no-brainer. If you’re at university for that piece of paper that is less and less likely to land you job, you might as well pay less for it. It’s liable to get worse, too. The recent Drummond report commissioned by the provincial Liberal government urges universities to adopt three-year degree models that would see students enrolled year-round and taking a significant portion of their classes online. They’re billing these as ‘low cost,’ but low cost for whom? What are students who work full-time in the summers supposed to do, beyond beef up their hours in tenuous, precarious part-time work year-round? I would hazard a guess that tuition rates won’t be falling to account for these prospective changes. I haven’t even touched on the quality of education issue or the more philosophical and political problems of running the university as a lean economic machine. 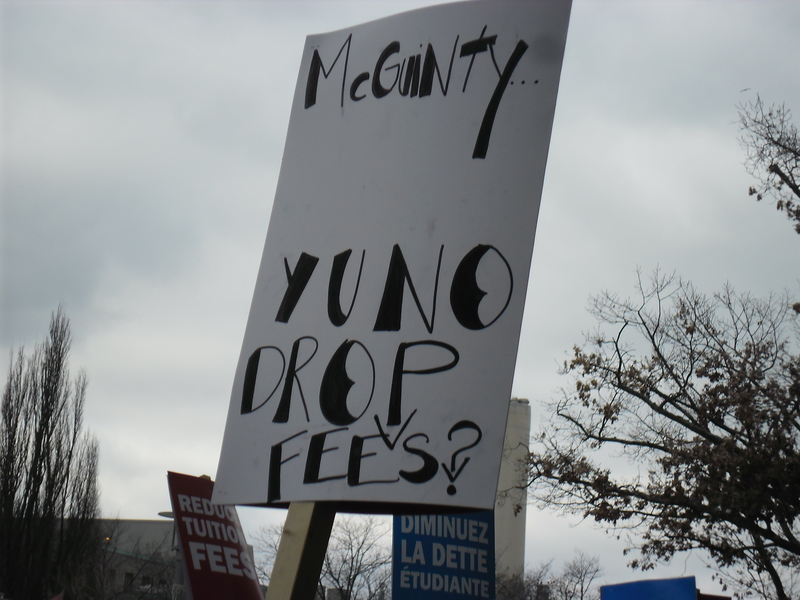 Tuition increases are not translating into improvements in the quality of post-secondary education. Fewer faculty members are being hired, infrastructure is crumbling (though that depends somewhat on one’s Faculty), and many students are finding it harder to access support. I’ll end with a challenge. There’s no need to wait until next February for the next CFS Day of Action to roll around. Each spring the McMaster Board of Governors meets to approve tuition rates for the following year. Let’s stage a sit-in, in the gallery of the council room, in the halls, and throughout the wider student centre. We can submit a letter of demands to our student representatives on the board and ask that they are read on our behalf. It will take more than this, of course, including a large-scale, coordinated effort of students and workers across the province to halt the austerity measures waiting in the wings, but that’s a whole other post.